How we can ask more specific questions to ensure that our young adults aren’t struggling in silence and be honest about what they’re experiencing in higher education. I wish I could take credit for the F.I.N.E. acronym. In fact, I’m not even sure where it technically originated from or whether it’s copyrighted. Regardless, it was something that I learned while in graduate school studying to be a counselor. After hearing its subliminal conveyed meaning, I’ve managed to never forget it. The letters spell out “f-ed up, insecure, neurotic, and emotional.” No, I don’t think every student is necessarily experiencing each of these emotions yet it certainly helped me in digging deeper much faster when working with students on a college campus. For every student that walked into my office during the five years that I was working in higher education, nearly every time I prompted a student to open up by saying “tell me how things are going for you.” If I got the response of “Everything is fine,” I knew that they had a problem. This assumption never failed. Seriously, ever single student. If they responded with “things are well” or “things aren’t so well, and this is what’s going on..” I knew they had self awareness and we could jump into solutions rather quickly. The students who said everything was “fine” were the ones in denial. They believed they could still get themselves out the hole they’d dug themselves in. Definitely not a simple task, and one that rarely happened with the students I was working with. There was no plan in place, no actions steps to initiate that change other than just speaking the words out loud and secretly hoping the problem would disappear. In that same office space, I had a comic by KC Green hanging on the wall. For the students who came in saying things were “fine,” I would point to the picture on the wall and sometimes ask “like this kind of ‘fine’?” If you’ve never seen the comic, I highly encourage you to take a look. 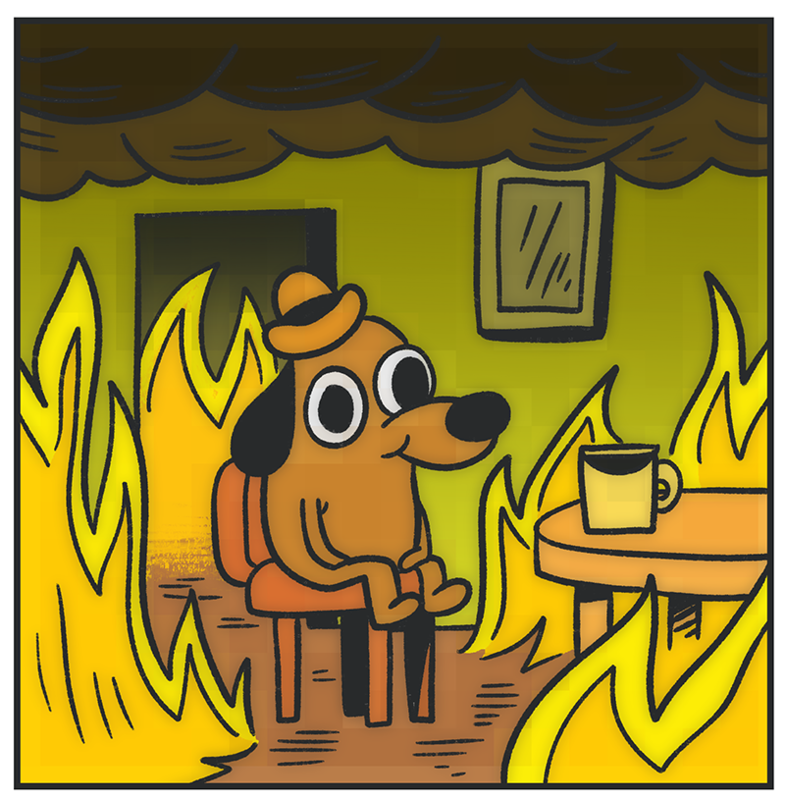 It’s a 6-panel drawing of a dog in a burning house who ends up getting too close to the fire because it keeps telling itself “everything is ok. This is just fine how it is.” For newer students who were meeting with me, they often appreciated comparing themselves to that comic. Sometimes, yet rarely, it would bring to light that things were actually going to be ok. On the flip side, it would bring a student to tears who was already on the verge as they realized they were in-fact that dog in the comic. To be fair, the comic itself is rather graphic. If a student is in crisis, this truly could be accurate to how they’re experiencing college at that moment. They really need advocates on and off-campus to make sure we’re asking the right questions to give them the space to acknowledge they really do need help and can’t get out of trouble on their own. Sometimes I would get phone calls from parents asking me why it would be important for them to help their college student, especially when their child was telling them they were “fine.” Or, letting me know they didn’t see any issues with their young adult when they just saw them at [inset any break period] and they appeared to be “fine.” We really need to kick that word. Like, for real. It is such a mask for us being able to truly articulate what we are working through. If you are a parent of a young adult in college, turn up your active listening ear the next time you speak to you child. Ask them how they’re doing. Ask them how you can support them. Make sure they aren’t sending out major hints that they’re covering up struggles. In being more attuned to the language that our young people are using, and in being more aware of what are some common struggles on campus, you can really help your young adult. They’re might be in the thick of the mess and not have the perspective that getting out is an insurmountable task. Not really sure what your child could be struggling with anyway? College years are supposed to be the best time of your life, right? It sure can be, and it can also be the most anxiety-producing. Although I wish I could say I was the one who wrote The Campus Cure [JL1] , Dr. Marcia Morris did an amazing job of highlighting very common problems, pressures, and crisis that college students are facing nowadays. Most importantly, that book was written specifically to the parent in an effort so you can better support your young adult. Owner and consultant for Lilley Consulting, Joanna works solely with young adults who need to be connected to mental health and substance abuse treatment programs. Sometimes these young adults are currently enrolled on campus, or those who have already left feeling defeated. She works with the entire family to help them heal and grow.